FILE - Hafiz Saeed, head of the Pakistani religious party Jamaat-ud-Dawa delivers a sermon at a mosque in Lahore, Pakistan, Nov. 24, 2017. Saeed has announced his group will field candidates in national and provincial elections in 2018. A Pakistani Islamist leader who has been accused of masterminding terrorist attacks in India says his group will take part in national and provincial elections in 2018. 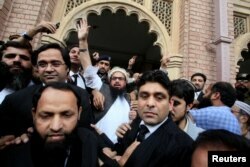 Hafiz Saeed, leader of the Jamaat-ud-Dawa (JUD) group, spoke to reporters in Lahore on Sunday. JUD has been designated a terrorist group by the U.S. He was recently released from a year-long house arrest and denounced electoral politics for many years. Saeed was released in November from months of house arrest for a lack of evidence. He has been accused of supporting militant groups that fight New Delhi’s rule in the Indian-administered Kashmir and masterminding Mumbai's 2008 terror attacks that killed 166 people, including six Americans. The U.S. government has offered a $10 million reward for information leading to his arrest for plotting the Mumbai bloodshed. Saeed’s JUD bills itself as a humanitarian organization without links to terrorists, but it is widely considered a "front group" for Lashkar-e-Taiba, which was founded by Saeed and has been banned for terrorist activity since 2001. The JUD organization recently launched a political party, Milli Muslim League, saying it wanted to make Pakistan "a real Islamic and welfare state." In its first foray into electoral politics, JUD-supported contender came in third in a by-election August in Punjab, securing more votes than former prime minister Benazir Bhutto’s Pakistan Peoples Party did. Hafiz Saeed (C) reacts to supporters as he walks out of court after a Pakistani court ordered his release from house arrest in Lahore, Pakistan, Nov. 22, 2017. Bukhari added that Saeed’s countrywide network of civil society and charity organizations that have provided humanitarian relief and education has helped him broaden his influence over the years. “They even run schools and colleges and recently launched Milli Muslim League, their political wing, and that’s their influence inside Pakistan. As you have seen, he has been repeatedly detained and then released,” Bukhari said. Arif Nizami, a Pakistan-based analyst, doubts that Saeed’s group would change its ideology after entering electoral politics. “Intolerance and extremist ideology are growing in this country. It is unclear what rhetoric they [Saeed and his party] will use in the election and whether their participation will increase extremism, but it is certainly not the agenda or the basis on which Pakistan was founded,” Nizami said. Saeed’s release and recent political developments in Pakistan have triggered suspicions that the country and its powerful military are making concessions to religious extremists. The U.S. government expressed serious concerns over Saeed’s release, saying it “sends a deeply troubling message” about Pakistan’s international counterterrorism commitment. The U.S. has for a decade accused Pakistan of sheltering or having ties to terrorists, such as the Haqqani Network and the Afghan Taliban, which attack NATO coalition forces in neighboring Afghanistan. Pakistan has denied the allegations. U.S. Defense Secretary Jim Mattis is expected to pressure Islamabad to end its alleged ties to militant groups when he visits the country as part of a four-nation tour that began Friday. Shanaz Aziz from VOA’s Urdu Service contributed to this report.